With solid reliability data in tow, Transphorm is set to ramp GaN production to meet rising market demand. To mark the end of 2018, Transphorm has revealed it has shipped more than 250 000 high voltage GaN FETs, which co-founder and chief operating officer, Primit Parikh, believes is testament to rapidly accelerating GaN market adoption. As he tells Compound Semiconductor: "2018 has been a game-changing year for high voltage GaN and we finally believe that the last several years of effort that have gone into GaN are now materialising very quickly." "Our 650V GaN FETS are deployed in customers' mass production, high performance power converters,” he adds. "We're already in data centre and industrial sectors, and expect more market penetration in areas such as consumer adapters, as well as volume ramping in these markets." Crucially for Transphorm, recently available field failure data indicates that products are reliable. According to Parikh, his company's GaN FETs now have more than 1.3 billion field hours of operation with low 'failure in time' rates. "This is very exciting and it's the first time Transphorm, or any supplier, has comprehensive field failure data," says Parikh. "These statistics only become meaningful at more than a billion hours, so this is a significant milestone for us and also increases customer confidence in GaN." Transphorm co-founder and chief operating officer, Primit Parikh: "Infineon and Nexperia joining [the market] is great news for GaN as it boosts customer confidence." Without a doubt, solid reliability data can only drive Transphorm's GaN devices further into more applications. Key customers include US-based power supply manufacturer, Bel Power Solutions, Japan-based servo motor manufacturer, Yaskawa Electric, computer peripherals supplier, Corsair, US, Taiwan-based computer power supply maker, Seasonic Electronics and solar/electric power generator developer, Inergy. US. According to Parikh, data centres will continue to be a key market for Transphorm, given the rise in edge computing and hyperscale data centres. And the company will also target adapters for consumer supplies. "There is a huge push to increase power density for power levels ranging from 65 W to 150 W within existing form factors, which silicon cannot achieve. GaN can do this," he says. The chief operating officer also has high hopes for automotive markets. Last year, Transphorm delivered the world's first AEC-Q101 qualified GaN transistor, which at 650V, targeted AC-DC conversion for electric vehicle on board chargers as well as auxiliary high voltage DC-DC conversion in air conditioning, heating power, steering and oil pumps. "This paradigm shift to electric vehicles has been so large and from when we first started sampling, customers have really been pulling us in," say Parikh. Transphorm 650V GaN FETS are deployed in a range of customers' mass production power converters. Parikh won't be drawn on specific customers but also highlights strong demand from Japan-based automotive manufacturers that want to fit higher power DC-AC power inverters into vehicles. "The Lexus, for example, has a 400W AC power plug but now people want more power with 1.5 kW becoming the norm in brand new vehicles," he says. "GaN can provide the size, weight and thermal performance that is so important here." 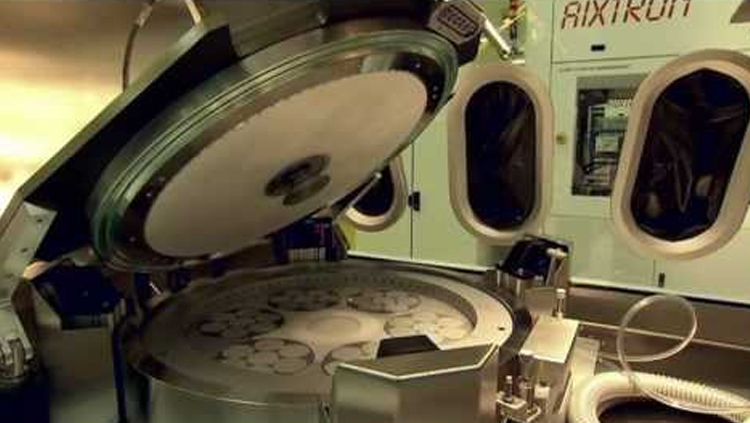 Parikh is also certain that Transphorm's stake in the Fujitsu-owned wafer foundry at Aizu, Japan, had been instrumental to fuelling demand here. "The Fujitsu factory has given us a strong Japanese market presence," he points out. "It has a good reputation as a long standing supplier of silicon products to the automotive sector, has proven GaN production, and has the ability to scale to volumes; this has all helped a lot in these automotive markets." And in the longer-term, Parikh also hopes to target the mighty drivetrain inverter in electric and hybrid vehicles. "This is a more conservative application but GaN can certainly address its needs," he says. Rising demand dictates rising volumes, and Transphorm is set to scale. Recently claiming that device volumes can be 'easily' increased by a factor of five, Parikh also asserts that the transition from six inch to eight inch wafer production will not be difficult when the market demands it. "Our ability to scale is strongly linked to the fact that we are a vertically integrated business," says Parikh. "In addition to MOCVD, our Aizu wafer foundry is also a silicon-based foundry, set up for huge volumes of silicon so there is lot of equipment here; we can scale when the need comes as the necessary infrastructure is already in place." Parikh is also confident that the industry supply chain is now in place, which he claims, may actually place GaN in a better position than rival technology SiC. "We start with silicon substrates and GaN can run in any existing silicon fab, with the necessary expertise in place," he says. "But look at the overall supply chain for silicon carbide; we see a few companies [including Wolfspeed, Infineon and Rohm] making the silicon carbide substrate, but we are also seeing shortages here, and this is limiting the supply chain." According to Parikh, in key applications the performance of 650V GaN devices already surpasses that of SiC, at a lower price point. "So now our goal is to provide GaN devices with better performance than SiC but approaching silicon-like prices," he adds. Transphorm's volume production plans also come at a time when Infineon has just unveiled its first GaN products, 600 V HEMTs with drivers, for adapter, wireless charging and server applications. The launch makes Infineon the only company, right now, to offer all power electronics technologies - Si, SiC and GaN - and, like Transphorm, the Germany-based semiconductor manufacturer is ready for volume production. Parikh isn't fazed. As he puts it: "More and more companies are either joining the market or have announced ambitions to do this, and companies such as Infineon and Nexperia joining us is great news for GaN as it boosts customer confidence." "Just as we saw with GaN LEDs, more companies are joining the marketplace and a core set of strong companies, with the strong technologies and IP, will now dominate the market for a few years," he adds. "This include us and the ride is just about to begin."